For the last two days, Willie has been acting abnormally. He regressed back to sleeping in the bathroom, instead of his dog bed beside my bed. He took his stuffed Kong in the morning to his usual place, but then wouldn’t eat anything out of it. He came into the office this morning and lay down in the dark cavern underneath my desk. All atypical for him, at least in the last couple of years. There’s something else that has changed these last 2 days, and that is the weather. I don’t know where you are right now, but in the midwest we’ve been pummeled by a tsunami of wind. The wind gusts have been over 60 miles an hour, and the roar of it was so loud it kept me from sleeping on Monday night. There are suggestions in human medicine (and from the field of biometeorology, which is exactly what is sounds like) that changes in air pressure can cause changes in one’s ability to concentrate, in the intensity of symptoms from everything from arthritis to chronic fatigue syndrome and in a general degradation in behavior. Gedeist (1966), for example, found that 4th and 5th graders exhibited more behavioral problems when the air pressure was low, and fewer when it was high. Thus, there’s a potential that rather (or along with) being a predictor of something scary, a drop in air pressure intrinsically affects the behavior of our dogs. I find this question of effects of weather on behavior fascinating–what about when changes in air pressure are less extreme? Can they still cause changes in behavior? If so, shouldn’t we be tracking that in dogs who have problems outside of Thunder Phobia? I’d love to learn more about this from the good readers of this list: Any anecdotes? Research citations? Any biometeorologists out there? MEANWHILE, back on the farm: It’s all about getting the sheep on the little bit of grass that is remaining (all that’s left is on the front lawn, thank heavens for Willie), working up to hiking 10 to 13 miles a day on the Milford Trek in NZ with a back pack (I took a 3 mile jaunt yesterday in the crazy cold and wind to test out my new gear: everything worked pretty well, though darn near got blown off the road on the way out), finding time to practice with Willie for the little trial we’ve entered and getting the farm and yard ready for winter (not doing so well on that score so far….). Here’s Willie and some of the flock. 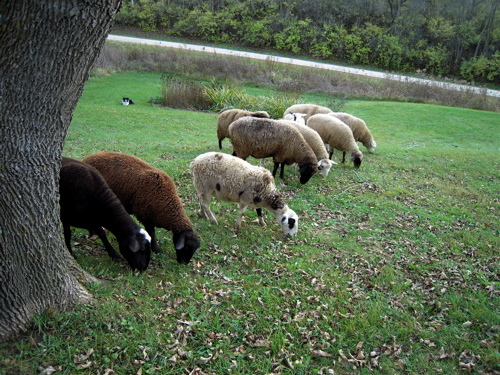 (Seems I’ve posted an awful lot of sheep/Willie/grass pictures lately, but that’s a big part of what’s going on at the farm. Besides, who wants a picture of me in full hiking gear? That’ll come soon enough once we get to NZ I expect…). Sorry if you’re bored with these kinds of pictures, I just never get tired of sheep grazing and good dogs watching over them. « What Do They Think We Do with all that Poop? I live in Fargo so we’ve been subjected to that same record-setting low pressure system. I noticed a big difference in Walter’s behavior on Monday and Tuesday, more pushy and bossy than usual. I originally attributed the behavior change to meeting up with his foster mom at the dog park over the weekend, but there could certainly be other factors involved. I know the pressure systems make a difference in how I feel. I have a (deaf) lighting (and other “flashy lights”) phobic dog. She *definitely* knows when there is a storm coming, and she’s not hearing the wind or distant thunder. Never get tired of your gorgeous photos! Interesting topic. My dog, Callie, has recently developed fear at thunder and wind. (She will be 8 in January). Storms never bothered her at all until recently. I can not figure out why this bothers her now after all these years. Oooh so jealous, I used to be a guide on the Routeburn Track on the South Island. Have a blast on the Milford! And of course I hope you get the chance to watch some of those kiwi dogs work! And I’m using the low pressure excuse for not getting any work done today. Never, ever bored of photos of Willie (or any of your dogs) with the flock. They’re always a treat! Not related (much) to dog behavior, but I can pretty much predict every fall when my inner ear starts to ache very badly. It lasts on and off for a few weeks. No ENT doctor could ever find anything wrong with my ear, and the only thing i could figure out was that it was related to pressure changes in the weather. it happens only in the early fall (august -Oct). Could there be some physical manifestation in Will as much as there is conditioned learning (low pressure before thunder storms)? Will reminds me so much of my GSD mix, Loki. So sensitive. patricia…what you wrote is incredibly helpful, as i’ve noticed the same behavior in my border mix. he’s never loved thunderstorms nor loud winds, but i can see how much more sensitive he’s become in his middle age. (he’s roughly 7 now.) before the rains even start, he goes to hide out in the kitchen, sleeping closest to the door. he’s now my barometric pressure meter! because as soon as i see him go there, i know a storm is coming. sometimes, if he’s feeling particularly unwell, i will lure him back to a safe corner and swaddle him with a big blanket. temple grandin talks about the ‘squeeze chute’ and how that pressure helps the nervous system to relax. and with theo, i do find that it helps him to calm down. and of course, it does help knowing that theodore’s compatriots experience something similar though. and thanks for explaining how it works for them! thanks again for your insights, as always. this is a particularly good photo, I like the composition very much. Despite my chiropractor’s comments to the contrary, I *know* that low air pressure, along with dampness, affects my arthritic joint pains. And I, for one, am not yet tired of pictures of sheep and dogs. Especially your beautiful, multi-colored sheep. Interesting thinking about the effects of weather – do we feel heavy and down in grey weather as much because of the air pressure as the low skies, I wonder? And the opposite with high pressure and clear skies? Or have we too learned to associate the air pressure with weather, and react accordingly? My sister was an infant teacher, and knew that a windy day meant a class of jittery, hyper children – and I have seen that in my dogs, too. A bright, cold morning with a hoar frost will have them dashing about in sheer delight; a warm, wet day and I can hardly drag them past the porch. Autumn here in New England has been beautiful again this year, and every time I look at my handsome dog working sheep against the radiant maples in the background, I wish I could capture the scene in a photograph, but alas, the photos never seem to do it justice. I love the timing of your posts. Ranger spent time visiting my classroom today and both he and the kids were squirrelly today. There was a big change in the weather from what it has been for the last few days. The weather had been typical northwest rain and gloom and today we had sun. I know the weather affects how Ranger behaves, he’s much more likely to spend significant time in the house when it is windy and after four or five days of rain and gloom he always seems subdued–I want to say depressed. Today, neither the dog nor the kids wanted to focus. The only time they all seemed settled was when he was stretched out on the floor and they were all petting him. It’s interesting hearing some of the science behind my observations. I should look up the air pressure for today. For years my Aussie Lacey has started trembling, panting, pacing, all the classic symptoms of thunderstorm phobia well before the storm actually hit. It took me a while to finally catch on that it was the drop in the barometric pressure that affected her more than anything else. Though Lacey is mostly deaf now and thunder itself doesn’t bother her, she still reacts strongly to the drop in barometric pressure. One thing that we have tried is phenobarbitol. We had another dog who had epilepsy and when he passed away had a lot of the pills left. Since we suspected Lacey’s problem was a brain chemical reaction to the weather, we decided to try it out. (Normally, we would never do anything without a vet’s advice but the only thing most of the vets around here wanted to give us was Acepromazine which paralyzed Lacey but failed to help her with the emotional turmoil she was experiencing.) It’s been somewhat useful and is certainly better than making her suffer. If there are any other potential suggestions out there, I’d love to hear them. I’ve tried associating the thunderstorms with goodies but it doesn’t happen frequently enough for a strong association to form. Amazing, I’ve been trying to figure out why my 3.5 yr. old Leonberger boy just regressed about 18 months in his behavior. Seems to have lost most of his confidence, has gone back to acting afraid of strangers (for him this means growling) and isn’t recognizing old friends. We’re in California Bay Area and have just had a couple of low pressure systems go through for the first time in months. I will be watching closely this winter to see if his behavior is tied to weather. Many thanks for this information! I’m in Wisconsin, too, & for the past two or three days my very good dog has been bad, trying to get away with things she knows she shouldn’t do. (My other, shamelessly opportunistic dog has been behaving normally.) I was a retailer for 35 years. In trying to figure out why one day’s sales would be great & the next day’s abysmal, we kept records & discovered the factor was barometric pressure. We theorise that people buy stuff when the pressure is low to cheer themselves up. Maybe dogs get the blues & want to endulge themselves as well, or maybe they need a little more attention. I had a standard poodle who would have grand mal seizures every few months when the pressure dropped. Not all the time, but that seemed to be a common factor. We never did any further testing to see why, since it wasn’t frequent and didn’t seem to affect his quality of life. Love photos of sheep and dogs! Keep posting them, please. I am in Ontario, Canada…we had very high winds and lots of rain yesterday and I have also experienced some odd behaviours from my dog. She isn’t the nervous type but has been very keyed up for the past two days..constantly whining under her breath and continually getting up and moving around (despite plenty of running and ball fetching). We just came back from a run and she usually passes out afterwards but is now sitting here whining under her breath. How interesting! I wonder if dogs are impacted by the change in the length of days? I know I’m starting to feel it already with the days getting shorter. I LOVE all dog pictures! Good luck in New Zealand! BTW, I am reading “Some We Love, Some We Hate, Some We Eat” and I dunno. So far, (to page 55), I am not impressed. It seems too tangential. Some reviewers are comparing him to Jarred Diamond and Micheal Pollan, but I wouldn’t agree. Both of the other two authors have a clear structure and are building up to a pivotal point. Herzog’s book feels like a rambling review of literature by a first year. Usually, I LOVE the books and journals you recommend. Please continue to post interesting reading material. I’ve noticed effects from low pressure, to the point that I count on there being trouble with my animals whenever the barometer drops. The year that finally clinched it, I was kicked by my horse, the dogs got into a huge fight, and when I went to the big rodeo that night the bulls wouldn’t buck, the horses were all over the place, and basically everything went haywire. The big act that night was a famous trick rider, and his horses couldn’t get a thing right until about halfway through the act. His horse was supposed to make a dramatic exit from his trailer and race up to him… instead, she sort of ambled moonily around the arena, and needed a redo before she could get her head in the game. I actually go to steps to keep things calm and low-stakes when the air pressure is low– no excitement for the dogs, nothing too risky with the horses. It just seems like a good idea. That’s a beautiful picture. Willie’s tininess (sitting!) makes him that much more precious. I experienced this last summer when traveling through Nebraska with my dog. The night we stayed in North Platte there was a tornado watch issued, terrible thunderstorms all night. My lab wouldn’t stay in his crate without whining and whimpering, and he’s usually very happy there. I heard similar stories from other guests in this pet-friendly hotel the next morning. I’m so glad you posted about weather and dog behavior. I have a 3 year old Australian Shepherd (male, neutered). I’ve always noticed that he’s more excitable, ‘ADHD’, and bouncier when it’s cooler out, which is understandable. But around the age of 18 months, he started to occasionally behave oddly at night, especially if the windows were open. As soon as we went into the bedroom, he’d pace, and would refuse to settle on his bed. He’d decide to spend the night on the bathroom floor. We chalked it up to a traumatic experience that occurred around the same time (a neighbor’s off-leash dog bit him), and that he was being hyper-sensitive to the smell of the neighbor’s dogs. But we’ve since moved, and have noticed the same behaviors crop up occasionally. Particularly for a week or so when the seasons change, it’s hard to get him to focus, and the odd bedroom behaviors re-surface. Strange. My 10 month old mutt was suddenly afraid to go out in the backyard as the weather system started to move in. By Wednesday morning when it was on its way out she was fine again. I didn’t connect it to the air pressure til I read this. A friend of mine has a thunderstorm-phobic Lab who definitely keys off the drop in pressure. The second the barometer starts to drop, he stops whatever he’s doing and goes to hide in the bathroom (with medication, they desensitized him enough to ride out the storms in a crate-like spare bathroom). With this same dog, around the time his thunder phobia got bad (age 3) it was almost like he had developed PTSD, because he started having panic reactions to any atypical noise, and the list of noises that would set him off kept getting longer. Very interesting. I get massive migraines when the pressure drops — everytime, without fail. I had “my” William out herding last week, and it was very windy. He was stressing and just not “on form”. No way to explain other than he wasn’t himself. I even trying going back baby steps, but I couldn’t get anything out of him. Later that day it dawned on me that not only did the wind bother the sheep that day, but it also affected William. He hasn’t been out on stock since, but it will be interesting to see how he does under better circumstances. I’m not surprised by the connection, since I get migraines when the air pressure changes (hated the Chinooks when we lived in Calgary – everyone but the migraineurs celebrated them!). Daisy doesn’t seem to care at 21 months, but I expect that, with her being fearful by nature, it will come. So will thunder phobia, I suppose…sigh. I live in MN (so I’ve got the crazy winds, and insane low pressure too) with a thunder-phobic border collie, who always knows when the storms are coming, I assumed due to the drop in air pressure–however this post, and all the comments, are making me think she has some secondary method of determining when there will be a thunderstorm. She couldn’t care less these past few days about the air pressure, made no difference whatsoever to her, since she knew that it wasn’t going to cause an actual storm. It doesn’t seem to have affected my other border collies either, but then they’re not thunder phobic, so I wouldn’t have expected it to. Interestingly enough, Trixie has ALWAYS been afraid of the thunder. It wasn’t an ‘onset’ sort of thing at all. She would have been about four months old when she was first exposed to thunder, and instantaneously disliked it. She is the most even keeled dog, with respect to everything else. Nothing (save thunder, and fireworks, which are very similar to a thunderstorm if you think about it–bright, flashing lights and a big boom) shakes her indomitable confidence. If thunder phobia commonly develops between 2 – 4yrs in dogs should we be doing more to try to change the emotional response to thunderstorms by counter conditioning? When I was very young my mother always brought me, my brother and my sister into the basement at the first rumble. We would sit huddled in the unfinished part of our basement, because there were no windows. We would stay down there listening intently to the weather report on the battery operated radio until we got the all clear and could safely return upstairs. At 7 I had a real fear of thunderstorms. At the same time my brother and sister and I went to live with my grandmother due to my mother’s untimely death. My grandmother was and still is a wonderful strong woman (she is 92) who fears not much and especially not storms. Seeing her 3 grandchildren so frightened of storms was very upsetting to her. She cured us of our phobia by bringing us to sit on the covered porch during thunderstorms with fresh popped popcorn, a radio playing happy music and stories of dancing in the rain. It worked like a charm. Now when there is a thunderstorm I want nothing more than to sit outside and listen to the rain hit the porch covering. I suspect that we can counter condition some storm phobic dogs, but definitely not all. I wonder if we would be more successful if we begin before any symptoms develop, as a preventative. I’m impressed that Willie just watches the sheep and doesn’t feel compelled to “move” them. Everybody in my immediate family has chronic sinus problems, and we get headaches and consequent irritability when a front is approaching. I always assumed the dogs were reacting to us! Thank you for adding another piece to the puzzle for me–chaining. I adopted my Australian Shepherd when she was seven. She had previously lived in Central Oregon where they have regular summer afternoon thunder storms. We adopted her in June, and I understood that she might take time to settle, but we had a rough first summer with her. Every day at 6:00 p.m. she would become restless and visibly agitated. On top of that, she was completely freaked by fireworks and thunderstorms. Fall came and she had a wonderful winter, but as early summer came, we began the same pattern. I suspect that the low pressure in summer is different than low pressure in winter, at least in Oregon. Electricity in the air? I worked with a holistic vet and talked with people about the fact that Maggie could read the weather, and she was very susceptible to barometric pressure drops. I mostly got blank looks from people. If there was a thunderstorm 50 miles away or if the wind was whipping around outside the door, she let us know with trembling, pacing, drooling, whining. Many times we could see, hear, sense nothing. And, that’s where that missing piece comes in. I am sure she feels/senses the change in barometric pressure and EXPECTS the thunder to follow. I missed that piece. After three years, we no longer have the summer 6:00 p.m. agitation, and I now have my tool kit to help her when she needs it. I use a body wrap most frequently (Thundershirt) which settles her, although it isn’t the complete answer during a storm or on July 4. Follow the directions, because it works best if the dog is accustomed to it. And, BTW, I also liked your column in BARK where you mentioned that it is probably okay to comfort a dog during a storm. I had been taught to ignore the whole thing and to act like nothing was going on for fear of upsetting her even more. I’m can’t tell that our little bit of sympathy helps, but it certainly makes us feel a little better. I would love to hear more suggestions for helping our dogs deal with this–maybe counter-conditioning as Liz suggests or some sort of training before they develop the phobia. Is it mostly the herders with their acute sensitivity? To Karen and Callie, I had a similar experience with my dog Niki. He is no longer with me but around the time he turned 9 or 10 he began developing a thunderstorm phobia. At first I was completely baffled, but after awhile I realized that this correlated with the time he was losing his hearing. My guess is that the phobia was pressure-related. Strangely enough, after his hearing was completely gone, or close to it, by the time he was 12-13, his phobia disappeared until I lost him at 16 1/2. Any thoughts on this? This is a tangent to your question, but I wonder about changes in altitude? The air is thinner up here, so there’s less air pressure. When we moved to the mountains with our Lab, she was only a tiny bit nervous about the whole moving thing, but I wonder if someone with a thunder-phobic dog would notice a bigger difference? And how long til the dog acclimates mentally? I also get migraines when the barometric pressure drops. I am going to start really looking at my dogs behavior during my next migraine experiences. Thanks for the insight. Funny, I live in Seattle the land of low pressure and rain. I wonder if that means I’m constantly effected or not at all? What I’d give anything for a good thunderstorm, though. We get them so rarely around here, but when we do, I’ve learned that my dog responds really well to a calming massage — slow, steady strokes and rubs. Now, when a sound scares him, he lies between my outstretched legs (which I use to gently squeeze/compress him) and expects a massage. He’s generally calm and oblivious to the sounds within 5 minutes. It works great for fireworks as well. It’s kind of like a human-thunder jacket. Even though it felt like an inconvenience at first, if I invest the 5-10 minutes, eh doesn’t react as much the next time. And I think it helps his nervous mood as well — learning to stay calm in stressful situations. I know it helps mine. Oh, and the the photo looks almost staged it so perfect. Love it! You’ve brought up a topic that I’d love to hear more about. I was always of the “ignore anxiety” camp (with a couple of exceptions)with all my other dogs, but Otis confounds everything I’ve been taught by responding beautifully to soothing. It doesn’t make him worse, it doesn’t (as I feared it might) encourage or increase the frequency of anxious reactions. It soothes him. Ignoring him, by contrast, works pretty poorly in most situations. Interestingly, one of the other exceptions to the ignoring camp was my lab/GSP/? mix who developed a terrible fear of thunder at four or five years old. She’d shake, pant, drool, etc. but the most noticable and consistent symptom was that she’d glue herself to me until the storm passed. As long as she was touching me, she was OK (well…managable, anyhow), but if she was outside or in another room when the storm started rolling in she’d panic; barking, howling, whining, flinging herself at the door, etc. One day I was just a few seconds slow in going to open the door to the back yard for her. She spotted me in the window on my way to the door and leapt on top of our gas grill in an effort to get directly to me. It was twenty years ago, so the grill (old then) was more solid than they are now, but it was only about sixteen by ten inches or so, and she was an 85lb dog. At the last second, she caught my incredulous eye and stopped short of ripping through the window screen as she balanced on the lid of the grill, nearly four feet off the ground. I pointed and she dashed to the door. Anyhow, my question is this. Should we be distinguishing between different types and levels of stress when we determine how to react to our dogs? When my dogs have simply been a little uncertain about a new situation, I find it works really well to leave them alone with nothing more than a little gentle prompting toward desired behavior. When they are extremely anxious, I don’t make a big deal about it, but it DOES really seem to help if I make an effort to soothe them, particularly with physical touch. For some dogs, I can see how touching and directing more attention to them might not help, but both of my “exceptions” have been dogs who deliberately sought physical contact and comfort in times of stress. I get the desire not to agitate or frighten a dog with excessive coddling or exaggerated concern on their behalf (same goes for small children…lots of times kids don’t cry until they see how upset mom is…) and I don’t want to reinforce inappropriate reactions, but I’m stymied over this issue. Dogs do comfort one another (and people). Not the same way people do, of course, but they do seem capable of expressing concern over their packmates’ distress. While I’ve seen a panicking or excessively fearful dog get ‘punished’ by other dogs at the park, I’ve also seen a wide yet surprisingly consistent variety of reactions to fear and anxiety among the dogs themselves. General insecurity (indecision about whether to cross a bridge, get in the water, play with the group, etc.) and submissive anxiety is usually dealt with by the group ignoring the nervous dog. Sudden fear (often signaled by yelping or ‘hitting the deck’)such as a dog might feel when in over its’ head in play or is surprised by a scary experience (like a snapping turtle). In this case the other dogs freeze, look for the problem, then generally trot over to give the yelper a gentle sniff and nose poke. On one of these occasions a border collie-sized dog went tearing toward Otis and his similar sized friend, intending to join their game of run and play wrestle, only to chicken out at the last second at the prospect of being tackled by the big guys. She yelped, despite the fact that no one had yet touched her, and dropped her rump. They both jumped back like they’d been burned, then both gave her a quick ‘sniff check’ before returning to their own game. I’ve seen variants of this behavior often- dogs checking and gently touching or licking a friend who has been scared or hurt. I’ve also definitely seen them clump together when stressed or unsure about something (like a backhoe parked in their field) with the more anxious dogs seeking reassurance and guidance from the more bolder members of the group. Dogs don’t make a big deal of it, but it seems to me that they do both offer and seek comfort from one another. I’d like to see more information out there on when and how it’s appropriate to offer the human version of this behavior. It’s possible to teach a young child to be fearful of experiences by making a big fuss the instant something unsettles them. For example a child learning to walk is understandably unsettled when they fall. A parent that rushes in and makes a big fuss about that fall teaches the child to be fearful of falling. A parent that waits for the child to decide how to respond to being unsettled by a fall–was it no big deal or did it really hurt–and responds to the child rather than the parent’s preconceptions soothes the child rather than creating fears. I’ve always thought dogs were rather akin to children in that respect. If the dog is genuinely distressed soothing helps. If the dog is merely unsettled and hasn’t decided to be fearful of the experience they can be taught to be fearful of the experience if the human makes a big fuss over it. In other words, if Ranger startles at a loud sound and I make a big fuss about it soothing and comforting him as if it were a big deal he learns it’s very scary. If Ranger startles at a loud sound and I say in a matter of fact voice “yep, loud noise” he learn’s it’s not a big deal. If he startles and runs to me cringing and whining I know he’s really scared and needs comforting. I just happened across your blog – I love it. I’m fascinated. I’m glad I found you – I’ll be back! I have a toy poodle (my pet), a tabby cat and I’m raising a Guide Dog Puppy, too. Full house! I am a loving owner of a border collie x springer spaniel who is coming up to a year old and going through the teenage thing! He refuses to go back on the lead etc! But I have noticed that recently during humid weather and today with thundery downpours with thunder he has become extra naughty and jumpy! Is this weather or age? By the way, I am in Bournemouth, south coast, England, UK. I am preparing for Pat Miller’s Advanced Behavior Studies class and one of our materials is For the Love of a Dog. On page 151 you write that thunder phobia usually arises between age 3-7 years. I couldn’t figure out which reference went along with that info so googled and found this blog where you say 2-4 years. Just curious on where the info comes from so I can read more. (I have a thunderphobic dog and am just wondering.) Thanks in advance for any help!! Good catch Tanzi! I can’t look up the reference today, but will do so next week. Meanwhile, check the vet references. I suspect the two different dates were from 2 different references, I’ll see if I can find them later this week. There’s a woman who did her PhD on treating thunder phobia, I just can’t remember her name today! Will find it for you… but I know it is typical for phobias, in general, to develop after some exposure, like allergies, and I suspect that a common age of first occurrence is three years or so… Hope this helps a bit. I see most commented in 2010 so my question is, has any one found a treatment or training that works for low pressure weather anxiety? My dog’s anxiety is getting worse, she is starting to associate fear with different noises. This is the first time she has reacted to low pressure with no thunder….well at least thunder that we can hear. We have tried ignoring and being calm but she starts climbing on everything to find comfort and knocking over lamps etc. The doctor has given her pills to reduce the anxiety but I would like to help her work through it with some type of training. She is not being a dog and enjoying life because of her anxiety. I know this article was written some time back but it was so helpful and re-affirming. I live on the East Coast (NH) and we just experienced a huge storm that the forecasters have been following for days. Last Monday my dog started acting fearful and anxious like she does when we have a Thunder storm but not quite as frantic. As the day progressed she got worse so I brought her to the Vet. She checked out fine . As the days went on she got more frantic, clingy and just plain not happy…..
Today the storm finally went out to sea and the dog is back to normal. I said to my husband that I wondered if the air pressure was what prompted the behavior….especially because this was such a large and powerful system! And here I thought I was safe till Spring! Thanks for the article….now I don’t feel crazy! I believe my dog Buddy, a Lhasa/Yorkie mix is definitely affected by the barometric pressure, I’ve been tracking for several years. One of the things he does is look up, quick head movements several times in a row. It seems to be getting worse with age during times of low pressure. Anyone else’s dog do this? Susan and K Zinck, my 21 month old rescue basset/lab exhibits the behaviors both of you have mentioned. I got him at 9 months, and until he turned 16 months, he didn’t react to noises. He suddenly started showing extreme anxiety in a thunderstorm, distant fireworks, air planes, and similar noises. He starts panting, trembling, climbing on tables, and constantly looking up when these noises occur. I’ve taken him to the vet, and there is nothing medically wrong. His trainer is even baffled by his behavior. He exhibits the exact opposite reaction to noise fears than are typical for a dog. Homeopet natural anxiety meds will take the edge off. Finally, one night I put him in his crate, and he curled up and went to sleep. I was reluctant to do that for fear that he would associate noises with the crate. I hope it works again. Storms are in the forecast for the next two days. I too have a dog that has been experiencing strange behaviors in low-pressure systems & storms. Two months ago he started behaving very strangely, with a very spooky behavior and then began having seizures. I have actually been looking into adrenal crisis & flight or flights systems. A wonderful thing to do and times of stress is something called the “place” command; getting your dog to relax on place, is like a “mental kennel.” I noticed someone else that mentioned a kennel and since dogs are naturally den creatures, often this will help too. Thank you for this post, although I think there is something more going on with my guy, I will definitely consider the barometric pressure as part of his plan when considering treatment! I’m a canine behaviorist and trainer. And, I learned many years ago, that I should never assess a dog’s behavior when the barometric is low. I just can not get a good reading on the client. Both human and the dog. LOL As a matter of fact, I just changed my clients for tomorrow to this week-end. Thanks for the article! My little dachshund started acting reclusive and lethargic as a major storm system started moving through (in Illinois), I am still taking him to the vet tomorrow to make sure he’s alright. But he was the picture of happiness and health just before the storms hit. He has been curled up in his bed inside his crate ever since. We leave the door open to show him he can go in and out as he pleases, but he wants no part of it. Worried about my little guy. We shall see what happens when he goes in for a check up tomorrow. I know this post is old but am so thankful to have found it. My nearly 7 month old Standard Poodle totally regressed today and was so naughty in spite of being exercised twice and having a normal day. Then after trying to figure out why he gas been so demanding and not with the program I put it together—we have a storm passing through the area with some rain in the mountains and lots of wind. Poor Jack! But, now I can at least know what is going on with him. I may give him some Rescue Remedy next time this happens. Thankful to have read all of these posts and appreciate the info greatly! Plus, lovely photo. i live in Western Australia in an area that can get strong winds in late Autumn- early Summer. My dogs are Australian Kelpies (herding breed) become very loopy in strong wind. My oldest is 6 1/2 and yesterday in strong wind she picked a fight with another dog on the beach. I was embarrassed and shocked at her behaviour but today Im reading articles such as this one and learning that it’s not just my monsters that act up in the wind. One article said that strong wind mixes up the smells and sounds, leading to sensory overload and subsequent anxiety – this makes a lot of sense – that what we are seeing is anxiety, not excitement. The article suggested creating safety by keeping them on the lead or finding a more sheltered place to exercise on those days. It’s so reassuring to read above how different dogs respond to low pressure/high winds. There are so many similarities with my three year old lab/schnauzer who has displayed extremely agitated behaviour during bouts of high winds. He is normally easy going and good-natured, sleeps in his open crate indoors at night but on windy nights he becomes so agitated that he ‘breaks into’ the living room and curls up on the floor against the couch. I came to the conclusion that he was ‘spooked’ by the wind. And now having read the contributions above it is good to know that some dogs can react like this and most especially to have some tips on how to treat the problem when it arises. Like the contributor who would ‘ignore’ I would also use this approach but I have also realised that that there are situations where a response is required to minimise habits developing. In some situations I feel reassurance/soothing/physical contact is helpful. I’m so grateful to all who have posted here. It’s been very helpful. I’m so glad to find this thread and that we can still respond even when it’s an older one. My sweet “golden shepherd” Duncan has been very noise phobic since I adopted him from a shelter 5 years ago tomorrow. He was about 2 then, so he’s 7 now. He has begun to backchain as described above. Pressure change (no noise a human can hear) – wind/rain – thunder – run frantically through the house barking OMG WE’RE GONNA DIE! until the rain stops. Occasionally he pees in the house too. If I can get him to stay still I’d like to try massage. Nothing else has worked. I can put his thundershirt on him, have him constantly surrounded by DAP in his collar, room diffusers and spray on his and my beds, give him benadryl, rescue remedy and homeopath treats…all of this at the same time doesn’t calm him. His trainer recommended xylkene (milk protein) so we’ll see how that goes. Any other suggestions are greatly appreciated. I feel like a “bad mom” when I’m not able to help him, and wonder if the stress could hurt his overall health or shorten his life. .panting..walking in circles..then becomes more severe..trying to hide in the refrigerator or the dishwasher.. I am glad I found this article. I live in Vancouver , WA. My 6 yr old male beagle has been acting strange all day. Very skittish and he’s wanting to hide out on my bed (my bedroom is super small so it’s like a den. He’s also been pacing and acting like his skin is itchy. We have high humidity today and there is a chance of thunderstorms soon. He hates warm weather anyway so this moisture in the air makes it worse. But at least I know now why this behavior all of a sudden.